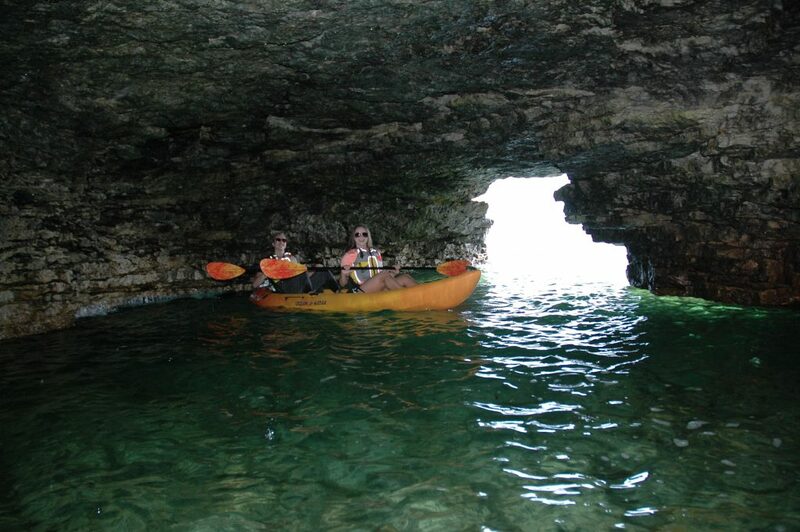 Legendary cave and shipwreck tours. 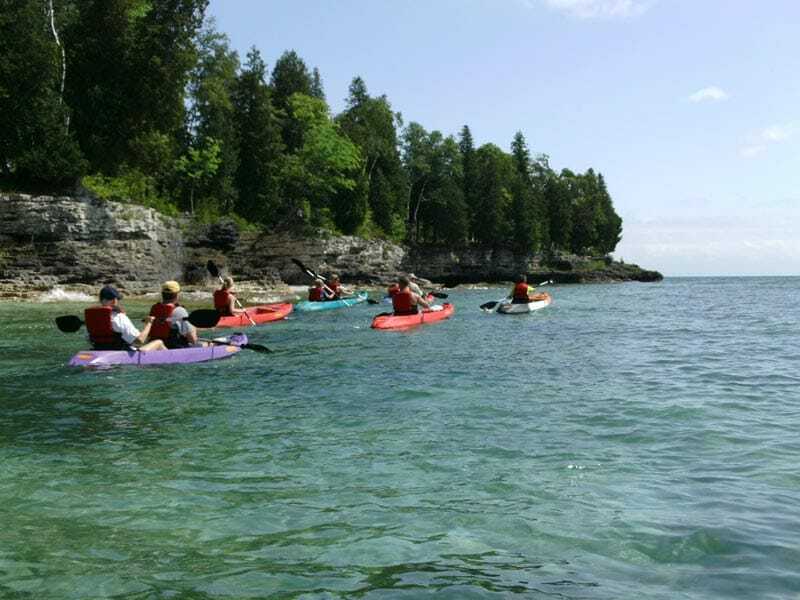 We offer the most exciting and variety of kayak tours in Door County. The scenic beauty of Door County’s waterways is truly spectacular. 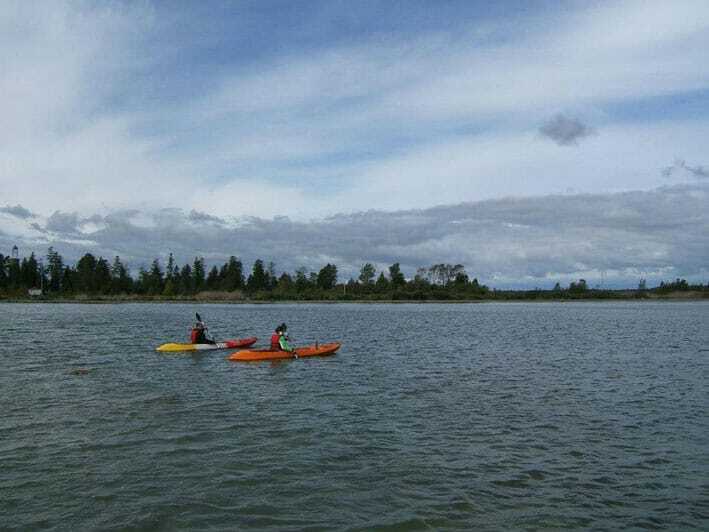 And, kayaks are the best way to see everything. 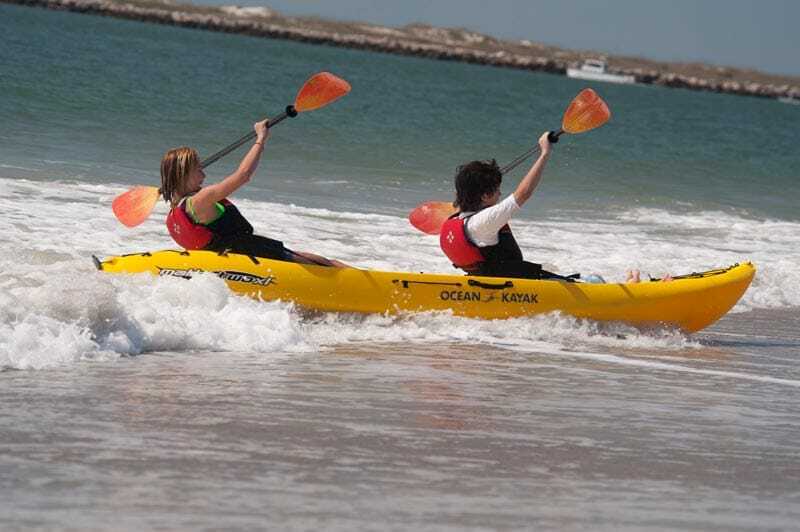 In fact, we had to make four different kayak tours because there’s so much to experience! 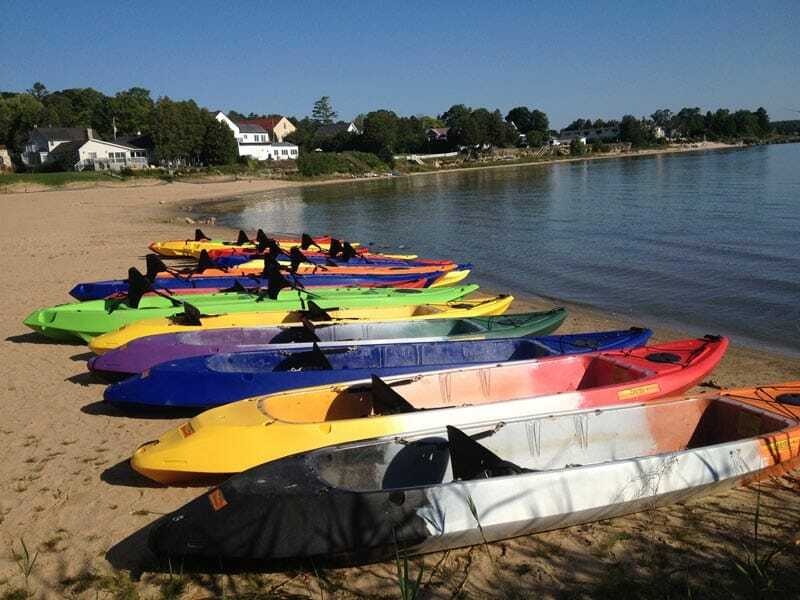 We provide the right kayak based on your age, size, experience, and tour. 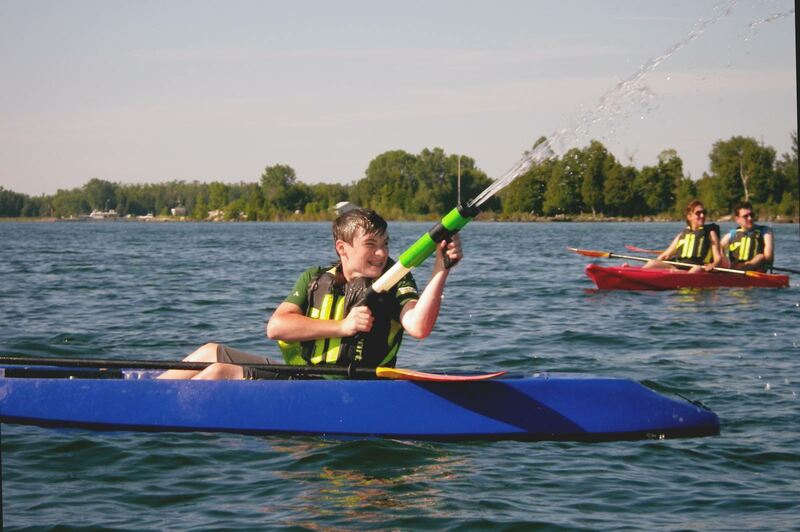 We’ll recommend the best configuration for all of your family members, likely a tandem with one adult/one child. 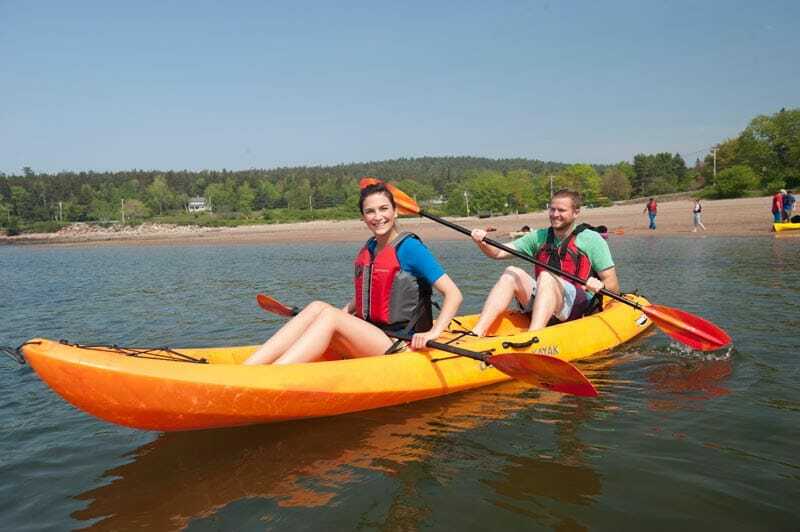 The maximum weight for single kayaks and small tandem kayaks is 300 lbs. 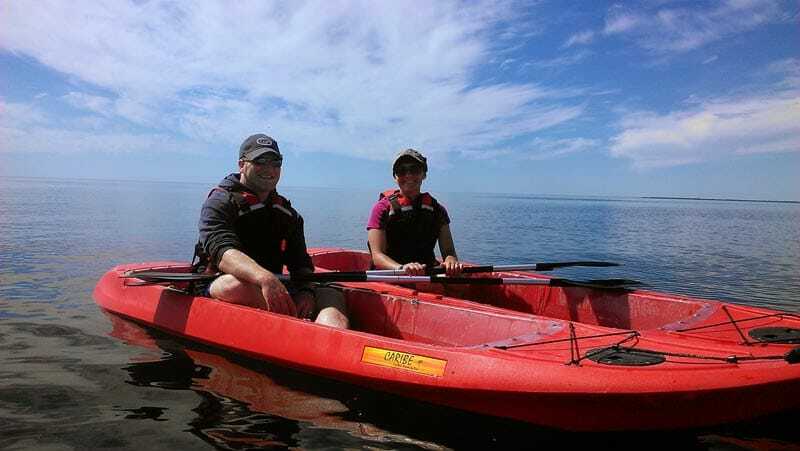 ; large tandem kayak maximum is 500 lbs. Just bring some bottled water and sunscreen, and wear water shoes/sandals and quick-drying clothing (polyester, spandex, swimwear). Wet suits are available to rent during cooler weather. We provide the life vests. 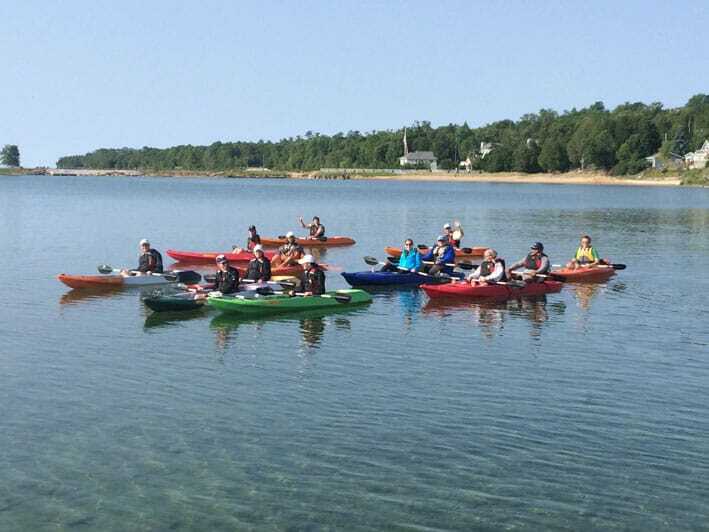 All tours meet at the Lakeshore Adventures office (8113 Hwy 57 in Baileys Harbor) 15 minutes prior to your scheduled tour. 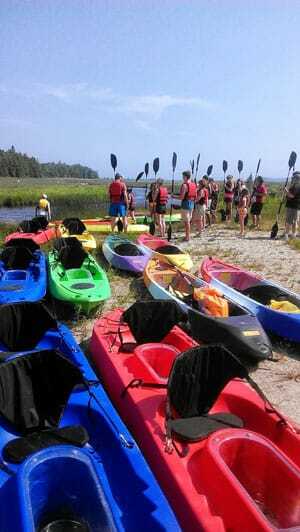 Kayak Tours are $59 per person. Full payment is due at the time of booking all reservations. Payment may be made by credit card for phone or internet reservations. 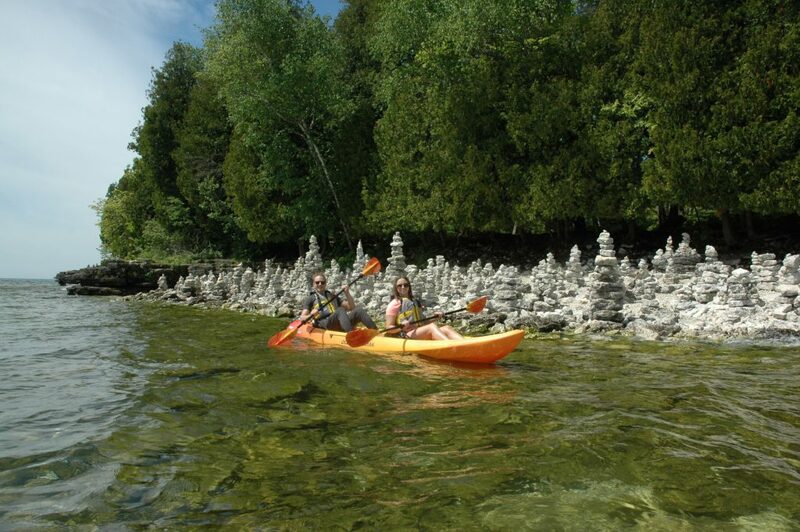 Cash payment is accepted when reservations are made in person at the Lakeshore Adventures main office. 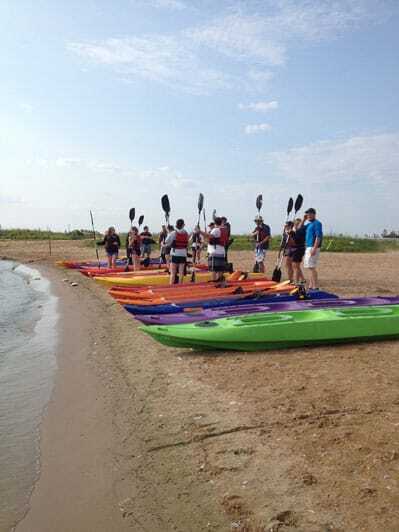 Visit our Kayak Tours Facebook page to see photos and reviews! 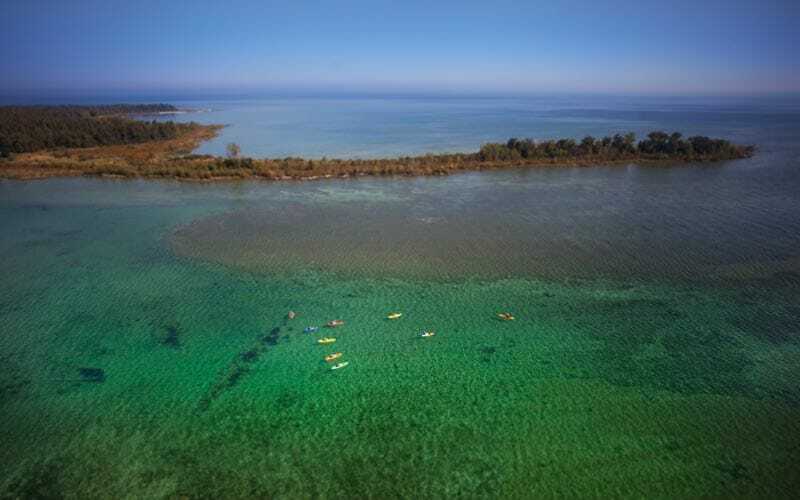 Door County has a historic maritime past, with 14 accessible shipwrecks to explore. 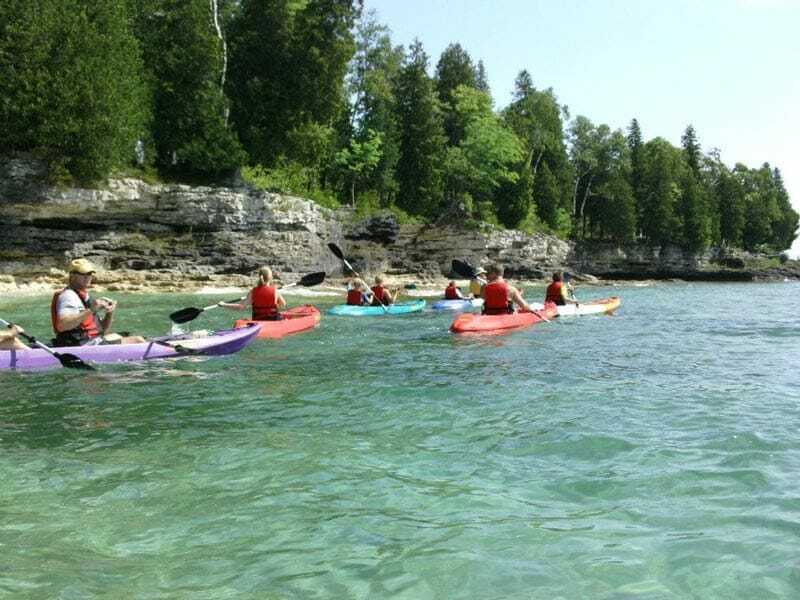 On this exclusive Lakeshore Adventures kayaking tour, you’ll paddle over several 1800s wooden schooner shipwrecks in less than 15 feet of water. 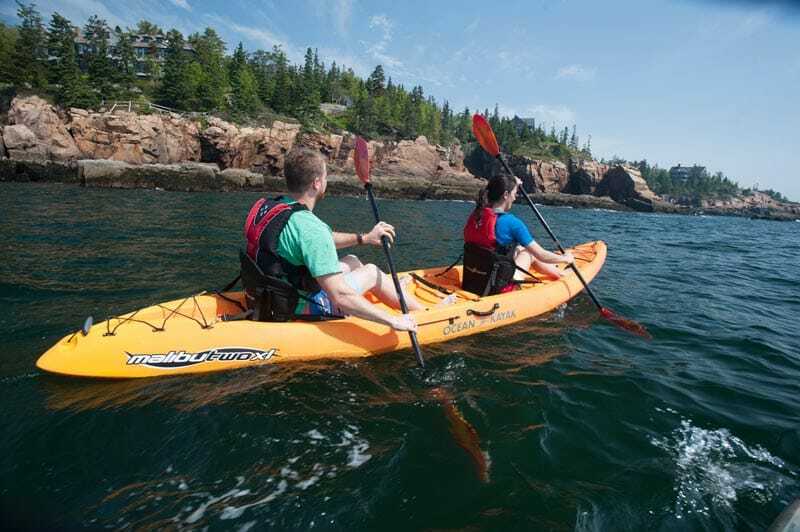 Your guide for this one-of-a-kind, 2-hour clear bottom kayaking experience takes you to a small island to see a 1820s Bird Cage Lighthouse and over as many wrecks as possible. 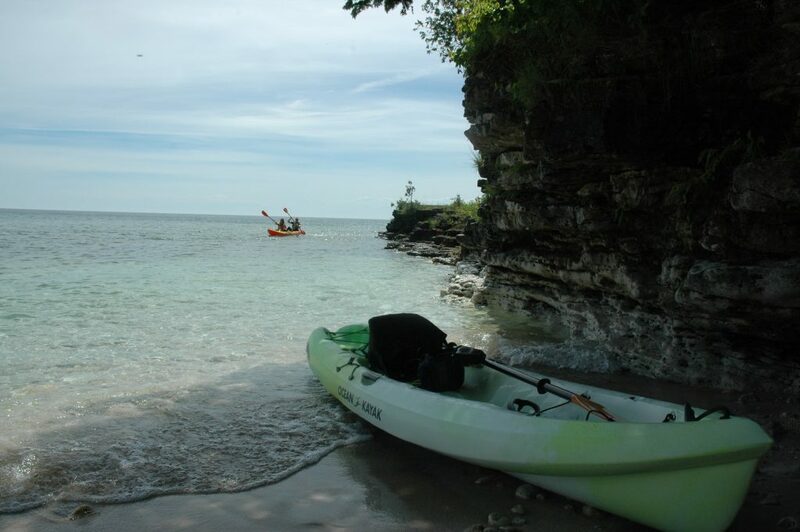 Prepare for a breathtaking paddle along the shoreline of Hedge Hog Harbor and Door Bluff, some of the largest limestone bluffs in the U.S. 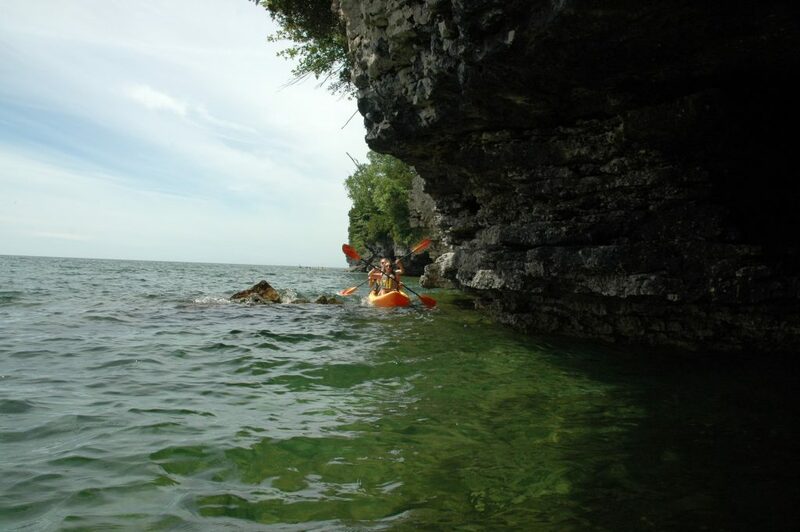 This 2-hour tour includes views of Washington Island, Gills Rock, and Native American pictographs in the stone face. 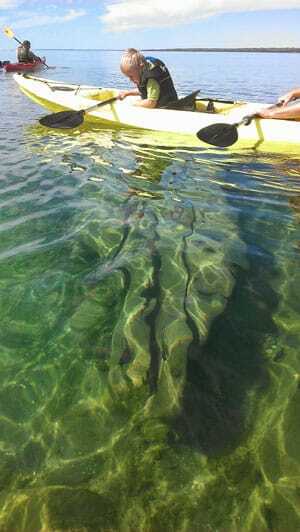 In the crystal clear water, you’ll see steep drop-offs and the shipwreck remains of the wooden schooner Fleetwing. 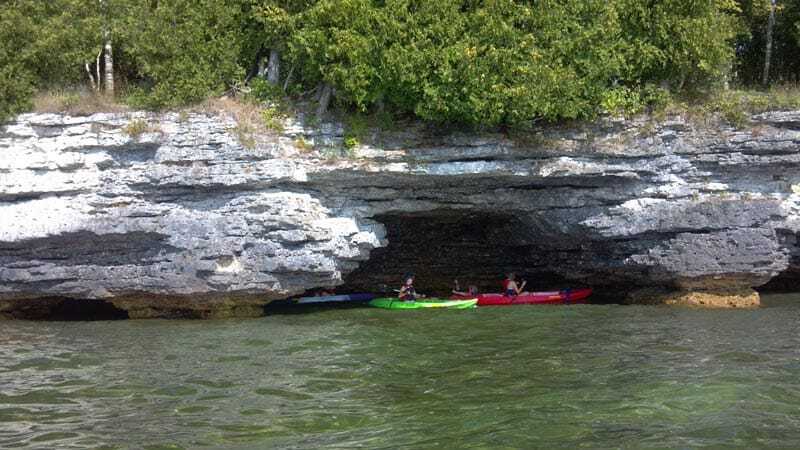 People rave about the Cave Point kayak tours of Door County with good reason! 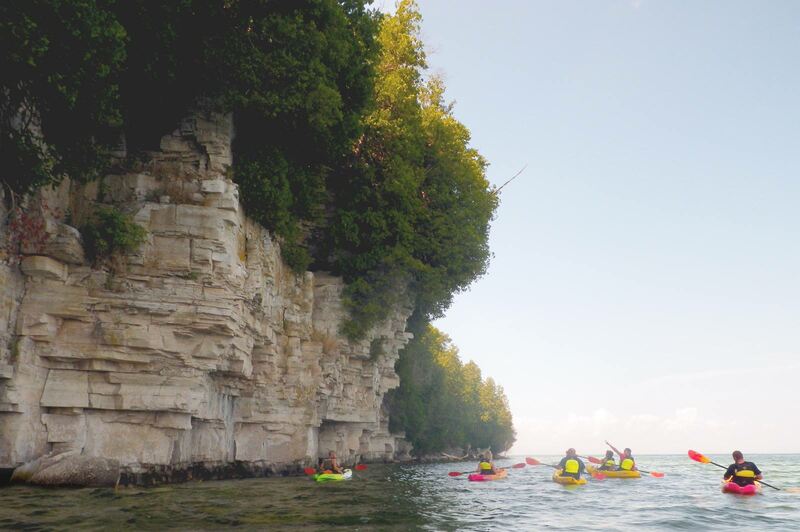 As you paddle along the Lake Michigan shoreline, you’ll see firsthand what over a thousand years of wind and waves can do to limestone cliffs. 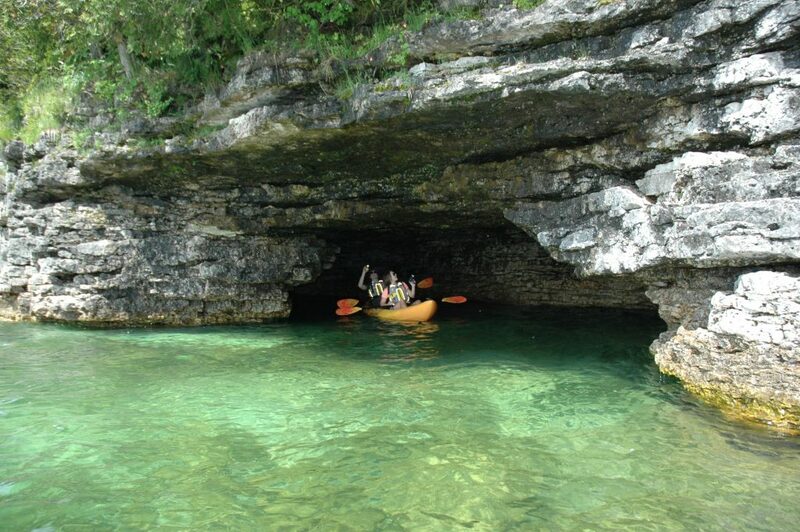 These underwater caves and tunnels are only accessible from the water. 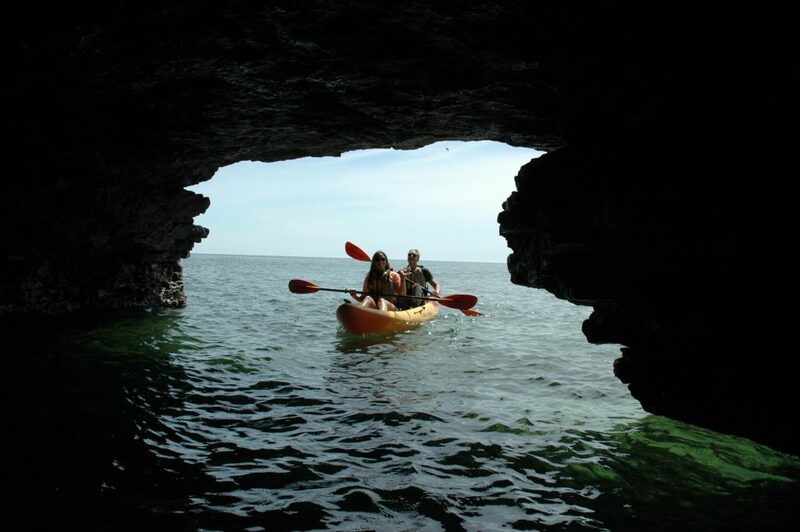 Don’t miss your chance to view up close some of Door County’s most spectacular natural wonders. 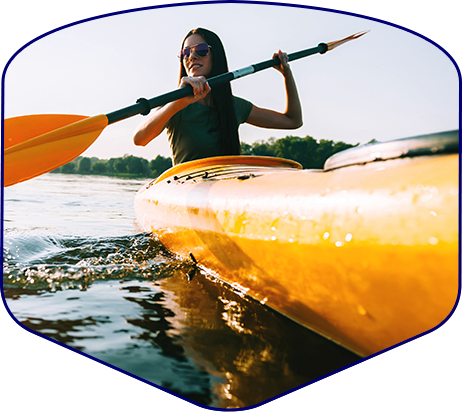 Northern Kangaroo Lake is pristine and protected, so it’s closed to all motorboats and only accessible by kayak or canoe. 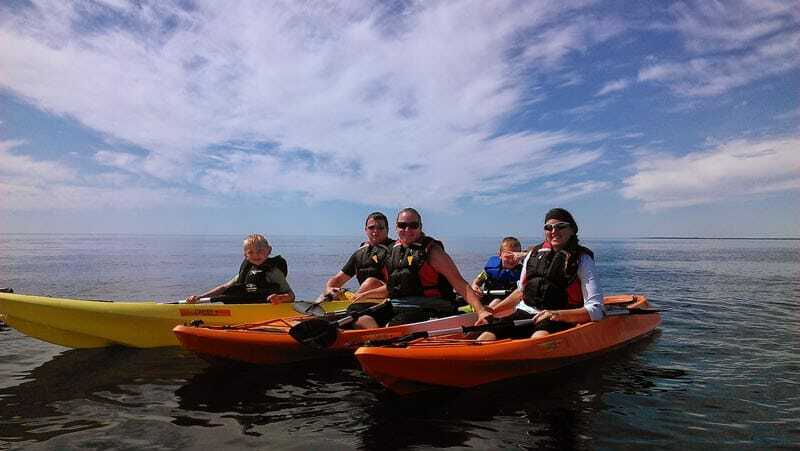 This 2-hour wildlife refuge kayak tour, perfect for families with younger children, is a great opportunity to absorb the area’s natural biodiversity. A naturalist from Ridges Sanctuary guides you over this warm, shallow, and protected inland reserve teaming with wildlife.